Notes: Based on the manga by Mohiro Kitoh, which ran from 2003 to 2009 in Shogakukan's seinen magazine Ikki. It is available in North America through Viz. A summer field observation trip brings together fifteen seventh-graders who enter a cave in order to explore it. 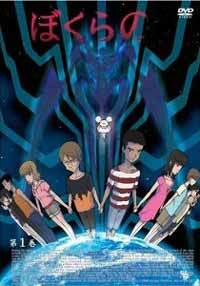 There, they meet a mysterious person Kokopeli, who entices them into entering a contract to play a game where they will control a powerful giant robot to fight off fifteen beings that will attack Earth. Little do they know that this is more than a game. Never has a show been so optimistically pessimistic, full of death, yet full of hope. Bokurano is rather hard to review without giving some parts of the plot away. Each of the children will pilot a giant colossus to fight off a series of enemies that will attack Earth. Think of it as "Natural Selection", if you will, the ultimate true test of altruism. If parallel universes do exist, somewhere on another Earth, another set of fifteen pilots are also chosen to represent their Earth. For the pilot that wins, their Earth is "selected for" and survive while the other Earth will be "weeded out". The catch - the robot is fueled by the life of the pilot. So, if they win, their Earth flourishes but they die. I think Gonzo finally got their blend right for this sci-fi drama anime. There's plenty to like about this series. The main characters drive the plot. All fifteen of them are rich and vibrant, each easily distinguishable with their own personality right in the beginning of the series. The structure of the series is very linear. Since each character takes turn to fight, they are each given about one to two episodes to showcase themselves. Thanks to this dedicated screen time, viewers are allow to connect with the cast. It really drives me (at least!) to frustration especially for characters that I have come to like tremendously and I just know that they will kick the bucket in the end. The plot keeps the viewers on the edge of the seat especially in the way that the next pilot is chosen. Each customised pilot chair is arranged in a circle that spins and as it comes to a stop on a chosen spot, the owner to whom the chair belongs to is the next pilot. This deadly game of Russian roulette begins immediately after a battle is won to pick the next pilot. So the chosen one knows regardless, their time is up and it sets the mood for the next story arc. I literally held my breath as I waited for the spinning circle to come to a stop. Who will be next? And it tugs at the heartstrings to see the chairs in the cockpit becoming more and more unoccupied, made more poignant because viewers are really drawn into the story as they lose their comrades when the battles are won at a price. Then, there's the not-so-innocent guardian with the strange name Koemushi (meaning Dung Beetle), that guides them through the battles and control of the robot. You'd be sorely mistaken to dismiss him as a mascot because he is thoroughly an obnoxious and selfish individual who takes joy in the pain of others, relishes in vengeance and does not give any second thoughts to dishing out punishments and showing who's boss. The only drawback about such a linear plot is that some characters are given very little room to grow and develop, especially those who are lined up at the front of the line, simply because they are killed off too fast. Nevertheless, those lined up at the back of the fight contribute to a very well developed and fairly believable storyline that wraps up rather well. Together with a stellar supporting cast, these survive-towards-the-end main characters drive the series. None of them are truly detestable and viewers can actually develop a sense of respect for each individual and their convictions. And make sure you hang on to your hats for some major plot twist. And of course, being Gonzo, Bokurano has some spiffy eye-candy and I'm sure the creators had a field time designing out-of-the-world giant robots! After all, there are more than fifteen fights to flex their creative muscles. Last but not least, the magnificent opening theme and the soulful endings by Chiaki Ishikawa are excellent. Even without Yuki Kajiura, she still manages to showcase her unique powerful vocals that fit the series very well. Recommended Audience: Teens and above with a mature mind, to understand the bigger theme behind the deaths and destruction and some questionable lifestyles.